Here’s a development that could have enormous global implications for the search for a new commons-based economic paradigm. Working with an academic partner, the Government of Ecuador has launched a major strategic research project to “fundamentally re-imagine Ecuador” based on the principles of open networks, peer production and commoning. In our increasingly complex urban age where the rate of change and innovation is rapidly increasing, the rigidity of outdated linear and analytic Cartesian design methods are being exposed as insufficient to meet the needs of the environment and the people. The River Commons event held over the first weekend of March 2012 was hosted by Shalesmoor, Kelham Island & Neepsend Network (SKINN), in collaboration with the University of Sheffield School of Architecture (SSoA), and Studio Polpo. From the Great Lakes Commons Gathering, October 2012, the following is a compelling Brief for the motivations for this Great Lakes Commons process and the hopes for what it might achieve. 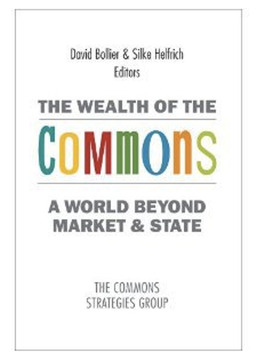 As a commons activist, after reading this Brief, i realized that this could become another example of very few multi-border regional commons processes that are attempting to break through to regional co-governance by commoners, where communities of people are claiming the power to affect the policy for their regional commons directly.